Don’t forget: The NFL kicks off its week early — at 12:30 Eastern time on Thursday, when the Bears take on the Lions. 🙌 Voris Struck is at the top of our Week 11 leaderboard with 93.4 points. 🏆 Greg Chili Van Hollebeke took over first place on our overall leaderboard with 778.4 points. 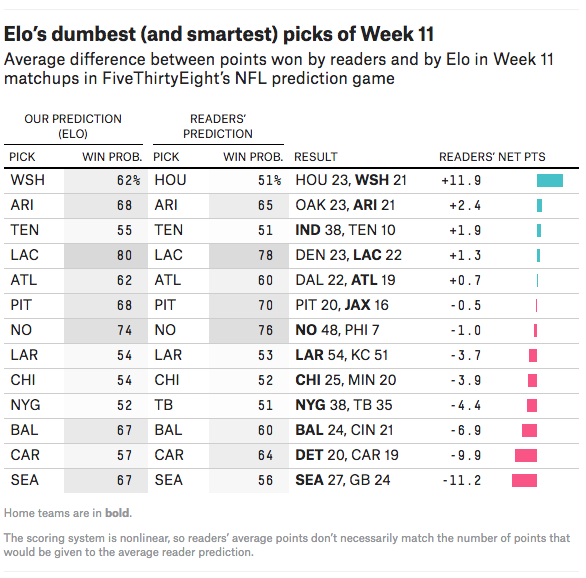 FiveThirtyEight’s Elo model is in 882nd place with 427.4 points.